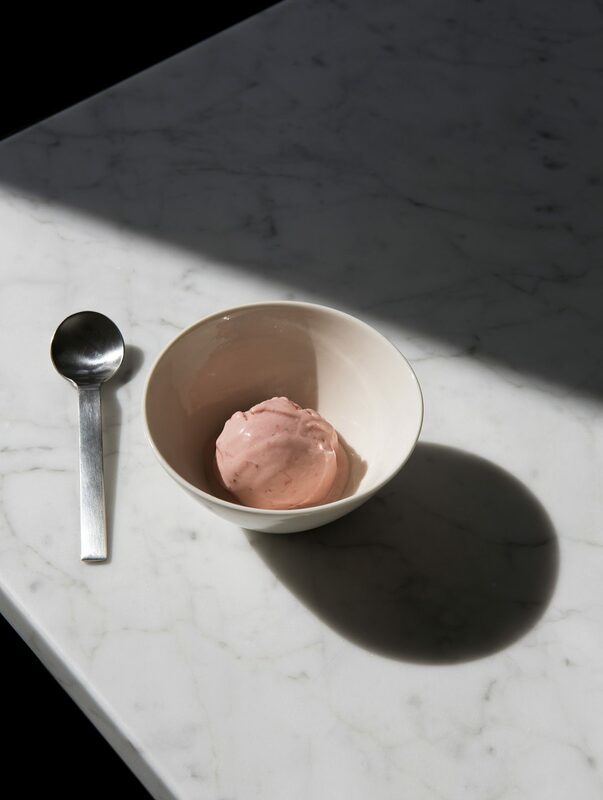 I think of strawberry ice cream as summer in a mouthful – it’s so deliciously bright, sharp and sweet. This recipe is slightly different. The addition of balsamic vinegar and the gentle roasting of the strawberries turns it into something altogether more grown up and elegant, with a mellow fullness to its flavour. Plump, ripe strawberries and good quality aged balsamic are absolutely essential. Prepare the vanilla ice cream base (see below) and chill thoroughly overnight. The next day, preheat the oven to 160°C/Gas 3. Wash and hull the strawberries and place in a bowl. Sprinkle with the sugar and a little pinch of salt, drizzle over the balsamic vinegar and toss together gently, using your hands, to ensure the strawberries are all lightly coated. Transfer to a roasting tray and place on the middle shelf of the oven. Roast for 5–6 minutes; the strawberries should still be firm enough to hold their shape. Allow the roasted strawberries to cool completely, then transfer to a blender and blitz to a purée. Fold the strawberry purée into the chilled custard base, then transfer to your ice-cream machine and churn until thick and creamy, according to the manufacturer’s instructions. Store the ice cream in an airtight container in the freezer until ready to serve. Pour the cream and milk into a heavy-based pan. Scrape the seeds from the vanilla pod and add them to the pan with the empty pod. Slowly bring to just below a simmer. Turn down the heat to as low as possible and continue to heat for 5 minutes, then remove and set aside to infuse for 10 minutes. Meanwhile, whisk the egg yolks and sugar together in a bowl until pale and thick. Pour on the still-warm milk mixture, stirring as you do so. Return the custard to the cleaned pan and place over a very low heat. Stir continuously with a wooden spoon, using a figure-of-eight movement, until the custard is thick enough to coat the back of the spoon and leaves a channel when you run your finger along it. Immediately remove from the heat and strain through a fine sieve into a bowl. Allow to cool, then cover and chill in the fridge overnight. The next day, churn the custard in an ice-cream machine until thick and creamy, according to the manufacturer’s instructions. It is now ready to serve as a simple vanilla ice cream, or to transform into a flavoured ice cream (see below and pages 183–9). Store in an airtight container in the freezer until needed. Mango ice cream Prepare the vanilla ice cream base as above and chill overnight. Peel, stone and slice 2 ripe mangoes (preferably Alphonso) and place in a blender. Add a squeeze of lime juice and purée until really smooth. Fold the mango purée into the ice cream base and churn as above.